Крошка Енот is a cartoon about a baby raccoon overcoming his fears. The baby raccoon, who lives in the jungle with his mother, is given the task of collecting sedge by the jungle’s pond for dinner on his birthday. The raccoon sets off into the foliage, eager to prove his bravery and maturity to his mother. On the way to the pond, the raccoon meets a monkey playing in the trees. The monkey warns the little raccoon of the fearsome “Тот-Кто-Сидит-В-Пруду” (“He Who Sits in the Pond”). Undeterred and boldly declaring,“I am afraid of no one,” the baby raccoon continues on his way to the water’s edge. Upon reaching the pond, the young adventurer searches for the mysterious villain about whom he’s been warned. Searching the grass and the trees, the raccoon protagonist finds He Who Sits in the Pond: a frightening reflection in the water, which the baby raccoon doesn’t realize is his very own. After running away in fear, the raccoon returns to his monkey friend. The baby raccoon remarks that he saw a “bad raccoon” in the water, and the monkey exclaims about the “evil monkey” he saw earlier. The monkey convinces him to return to the pond with a stick in order to ward off He Who Sits in the Pond, but first the frightened baby raccoon runs back home to his mother. His mother reassures him, urging him to return to the pond and smile at his foe. Though hesitant to take his mother’s advice, the baby raccoon does just what she advises. After smiling at his reflection, which had terrified him so deeply, the young raccoon is able to collect the sedge his mother needs for dinner and returns home. On his way home, he tells the monkey about how he overcame his fear, and they walk away singing about smiling, friendship, and brighter days. This Russian cartoon’s music gives away the fact that it is an older production; the classical accordion and violin music that sprinkles the storyline is not so common in today’s animations for children. Its music and the visual representation of the characters on the screen is similar to that of a 1950’s Walt Disney production in terms of the instruments used and the flat and evidently hand-drawn qualities of the cartoon. The dark colors used in the animation, the grainy quality of the production, and the way that the characters contrast so starkly with the background add a somberness to the cartoon. Though it is aimed at children, Kroshka Enot possesses an emotional realism that isn’t common in contemporary children’s cartoons. This is manifested in the eerie way that the monkey appears before the racoon, and how he eggs the racoon on to meet the “monster” in the pond. Though the two end up becoming friends, the way the monkey is depicted (as potentially malevolent in the way that adult characters are sometimes portrayed in children’s films) is not what most of us would expect from a portrayal of a friendship between children in a cartoon. Крошка Енот’s message about facing one’s fears is wholesome and pure, and the frightening path that the audience and the young racoon take to reaching the epiphany that smiling at what frightens us can help us to overcome it makes that message vivid and convincing. 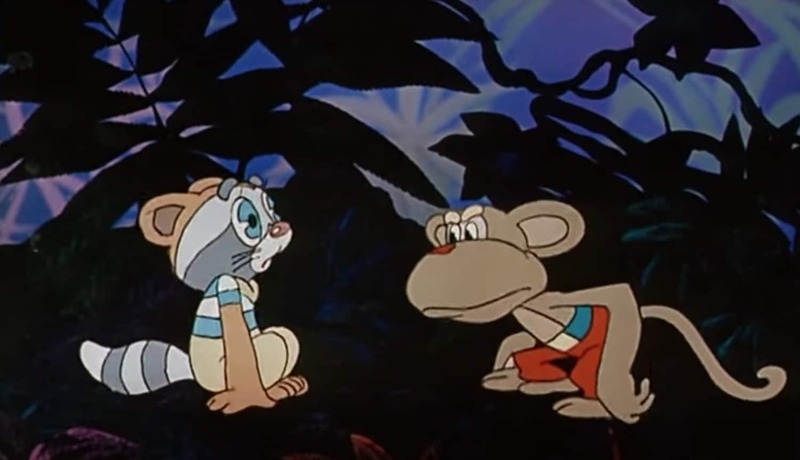 Крошка Енот was produced in 1974 in the Soviet Union by the production company Экран, or “Screen.” Directed by Oleg Churkin and voiced by Klara Rumyanova and Mariya Vinogradova, the children’s cartoon reaffirms the unity found in friendship and camaraderie. The timeless life lessons taught in Kroshka Enot will surely resonate with modern audiences. Watch the full cartoon on YouTube here. Lucine Poturyan is an Armenian-American student double-majoring in Government and Russian, East European, Eurasian Studies (REES) at Wesleyan University in Connecticut. She is currently studying the role of cultural diplomacy in international politics through SRAS’s Cuba-Russia Connection program. Writing about Russian and East European culture helps her sharpen her multicultural communication skills and gain the background and open-mindedness that will be fundamental to her future international law career.